A decorator object allows you to add new behaviour to other objects at runtime. You can also think of this in terms of graphical interface components where a decorator object contains a border or shadow which it uses to actually visually decorate another graphical component. However a decorator can also add new functionality to existing components, like scrolling and zooming. It is a good alternative to subclassing (inheritance) which allows you to create child objects with a new behaviour during implementation. Subclassing extends an entire class hierarchy, decoration allows the transparent extension of particular objects at runtime. This also means that you don't have to subclass several times for the same functionality - you can add one decorator (one "functionality" or "behaviour") to many objects. 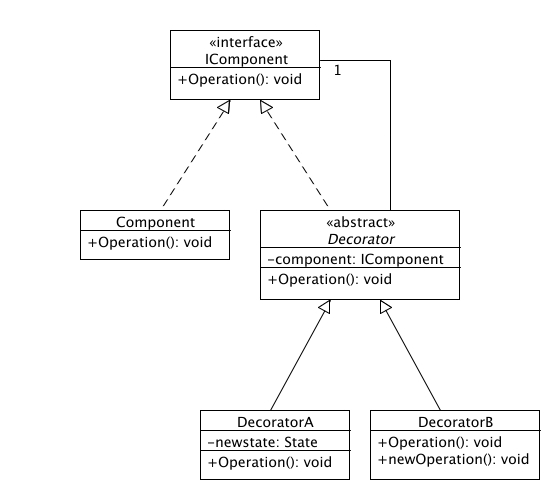 To achieve this, a Decorator must maintain the same interface as the object it "decorates" and it must accept the object it is "decorating" as an argument in its constructor. It keeps this original object in a private member variable. The advantage of using the decorator pattern becomes quite clear when you are confronted with a large number of independent ways to extend functionality, especially when you can't predict at design time which combinations of extensions will be used during runtime. You can decorate a decorator object by simply nesting them within each other since they all conform to the same interface and forward their messages to the next decorator or original object. The Decorator pattern is also known as "Wrapper". It provides its functionality by wrapping itself around the original object. remove these (encapsulated) responsibilities again without affecting other object. extend classes without subclassing. Sometimes subclassing results in an explosion of the number of subclasses to support different combinations of these extensions. 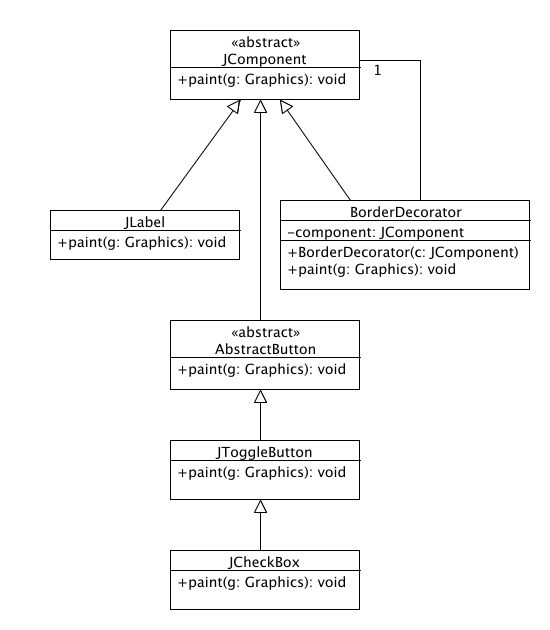 This sample code is based on [Budi Kurniawan, "Using the Decorator Pattern", ONJava.com]. We will try to show the relevance of the Decorator pattern using a real-world example which is also the most widely used example for this pattern - Java Swing components. In this example, our decorator will actually visually decorate other Swing Components, however keep in mind that decorators can also be used to add new functionality rather than just a new look, which is what the word decoration implies. First lets take a look at the JComponent class, this class has a lot more methods than shown in this code, we are only looking at the bare minimum amount of methods necessary to explain decoration. Now lets create our decorator, it inherits directly from the JComponent class, which means it will also inherit the implementation of JComponent's serializable interface as well as JComponent's implementation of the abstract methods defined in the Container class. Notice that the constructor of BorderDecorator adds the parameter "c" which is a JComponent as a child to the component of the decorator. Since we are also using the BorderLayout, this child element will occupy the entire area of the decorator. Also notice the modified paint method, it first calls the paint method of the parent class, after this our decorator draws a border around it, after first establishing height and width of the element. Since our decorator conforms to the same interface as JComponent, there is no difference in appearance between our decorator and any other "undecorated" or "regular" JLabel or JCheckBox.